1. The following Staff Requirements have been compiled for an aircraft carrier to meet the decision to build a fully protected carrier. 2. 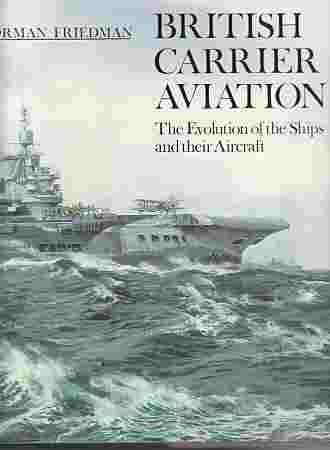 The carrier should be fully fitted as a Flagship. 3. Displacement. This must not exceed the Treaty limitation of 23,000 tons. 4. Speed. An emergency speed of 30 knots at deep load draught with an operational speed of 29 knots. a. Sufficient steam 150 hours at 16 knots with steam for 30 knots; plus 80 hours at 25 knots with steam for 30 knots. plus 8 hours at full speed. All on the hypothesis of 6 months out of dock. b. An addition of about 35pc (E in C being consulted in this matter) to allow for abnormal consumption due to weather, damage and oil left in tanks. c. As much additional fuel as the tonnage and space available permit. Note: The endurance of Ark Royal is estimated at 12,000 miles at 14 knots for six months out of dock and satisfies the above requirements. It is believed that an endurance of 11,000 miles at 14 knots would be sufficient. 6. Manoeuvrability. As high as speed of turning under rudder as is possible without causing the ship to heel unduly, is required, so as to shorten the time of turning into wind for flying operations. 15 – 4.5 inch HA/LA guns in W.D. twin mountings in four groups of four guns each; each group to be capable of separate control on either HA or LA targets. The whole broadside of 8 guns also to be capable of control from either director on that side (as for Ark Royal). It is desirable that the guns should be capable of fire across the deck at as low elevations as possible. Supply of ammunition should be by two endless chain hoists per mounting. Owing to the impractability of siting the magazines below the guns, horizontal conveyors will be required. Adequate ready-use stowage is required at the gun positions. The question of blast upon aircraft ranged on deck should be considered when the positions for the mountings are chosen. 6 – 8 barrelled Mk M Pompoms. To be sited as clear of the blast of the 4.5-inch mountings as good arcs of fire will permit. At least two of these mountings should be capable of fire through as wide an arc as possible either side of the fore and aft line ahead and two similarly through the fore and aft line astern. 0.5 inch Multiple Machine Guns. A minimum of four 0.5-inch multiple machine guns to be fitted giving adequate ahead and astern fire and command over the flight deck. Lewis Guns. As many Lewis Guns for which space can be found, and which can be manned, should be fitted. They should be mounted where they can engage aircraft attacking the flight deck with the M.Gs or low bombing. Side. Side belt protection to the sides and ends of the hangars and to the magazine and machinery compartments should be 4.5-inch C armour. Deck. Where not protected against bombs or plunging fire by the armoured flight deck , the magazines and machinery compartments should be given a 3-inch deck. Consideration should be given to protection of the hangar floor from splinters of shell bursting below and outside the 4.5-inch side protection. Steering gear. The steering gear should be protected by not less than 3-inch NC armour, sides and deck. Bridges. Bullet proof plating should be fitted to the bridge – plotting positions and observers’ offices in bridge structure. Under water protection should be provided against 750-lb underwater charge in contact with the side. Venting of explosions (occurring under the ship’s bottom) should be arranged where practicable. 4.5-inch. A minimum of 400 rounds per gun and as much additional as can be arranged. Mk M Pom-Poms. A minimum of 1,800 rounds per barrel. 0.5-inch M.Gs. A minimum of 2,500 rounds per barrel. 10. Habitability. The flying complement for which accommodation is required is estimated to be 78 Officers and 347 other ranks. The ship’s complement is estimated at 840 Offices and other ranks. 36 aircraft of present T.S.R. dimensions. Two lifts (45ft x 22ft) at forward and after end of hangar. i. The stowage of the two types should be interchangeable. Lifts should be large enough to take ‘B’ bomb, which is of greater diameter than the S.A.P. ii. Cases only. Can be stowed anywhere convenient. It is desirable that a proportion of all types of bombs should be stowed aft in a second bomb room. Consideration should be given to the possibility of stowing a proportion of torpedoes in armoured recesses in the hangar wall. If this can be done provision of mantlests in the parking space would not be necessary and arming and re-arming would be more expeditious. The parking space should be arranged as in Ark Royal. Stowage is required for 45 18-inch Mk XII torpedoes. Bomb lifts should be fitted from each bombroom direct to the flight deck, with an unloading position at the hangar level. The bomb lifts should be of sufficient size to take the ‘B’ bomb. Each lift should be capable of supplying 72 500-lb boms in 20 minutes. Six in number arresting wires should be provided. A crash barrier is required. 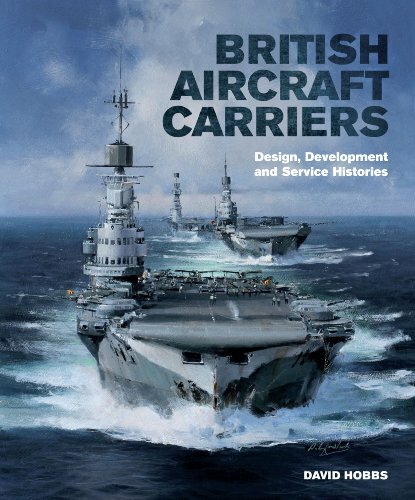 The position of this barrier cannot be accurately determined until the effect of the streamlined stern of the flight deck has been tested in Ark Royal, as this affects the ability of pilots to land further aft in existing carriers. The span of the aircraft will be 50 feet. Parking with their possible effect upon the close range weapons mounted abreast the island on the port side..
Two in number are required and should be sited abaft the island one on each side. A wind breaker is required at the fore end of the foremost lift. This question is under investigation especially over the area covered by the 3-inch armour on the flight deck. Officers are required as in Ark Royal. b. Oil stowage is required for 2,000 gallons of oil for aero engines. A homing beacon fitted on the island mast is required. Armament: 16 – 4.5 inch HA/LA in twin mountings in four groups of four guns.